The "intensity" of our exercise regimen means just how hard we are pushing the exercise in question. It is really a subjective test and one that you have to decide is best for you. Set up a schedule of say�1-4 for moderate exercise; 5-8 as average; and 9-10 as maximum effort. For beginners: Try to stay in the 1-4 range for at least 4-6 weeks. That should particularly apply to those with arthritis and/or other health problems. As you are working in this time frame, try to "interval" up only to the extent that you are comfortable. In other words, don't push yourself too hard. Let's use walking/jogging/running as an example for now. Moderate range of exercise: For most of you who are just getting started, this means for example, walking with some "speeding up" for minutes at a time. (In other words, don't try to go out and begin jogging right away.) As you get to the 5-6 week time frame, you can likely escalate up to a slightly more aggressive walk and even add some jogging. How long is too long? Here, we need to focus on just how much "time" is involved in walking. For most, I would not recommend going beyond twenty minutes during those first few weeks. If you feel that you can handle more, that is fine. As you break through that 5-6 week level, you may find that you can comfortably handle thirty minutes or more. Intensity: Again, using walking/jogging as an example you can also gain some benefit by walking in an area where you have hills and slight grades. This will of course make a few more demands on your body and as long as you feel comfortable and at a level where you can handle it, do it. Frequency: I think in the "best of all worlds" situation, we would like to feel that we can exercise every day. Of course, that is not necessary and in many situations it is more than necessary. If you can do it and also enjoy it at the same time, that is good. I would say that if you can get 30-40 minutes of (walking for example) 3-4 times weekly, you are doing a good job. Measuring intensity: One of the things that I like about walking/jogging is that nearly everyone can do it. Also, it affords you the opportunity to use "interval" exercise techniques without putting too much stress on your body. One more point should be made. It is easy to judge "interval intensity" by using landmarks. For example, the corner store might be your first goal at a certain speed; the second might be a tree that is down the road where you are going to drop down your speed, and so on. Type of exercise: Not everyone can lift weights or swim. (Some because there is just no convenient place to do so; winter weather; equipment, etc.) However, these general guidelines can apply to any type of exercise. Use "interval" exercise to its maximum advantage whatever you are doing. 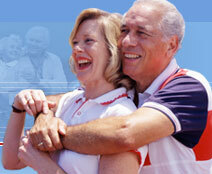 It pays big dividends not only in joint care, but in overall health as well.